US PGA Tour Player of the Year Brooks Koepka seized the third round lead at the CJ Cup at Nine Bridges on Saturday. The world number three shot five-under 67 to move to 13-under for the $9.5 million US PGA tournament. He is four shots clear of fellow American Scott Piercy and Englishman Ian Poulter. 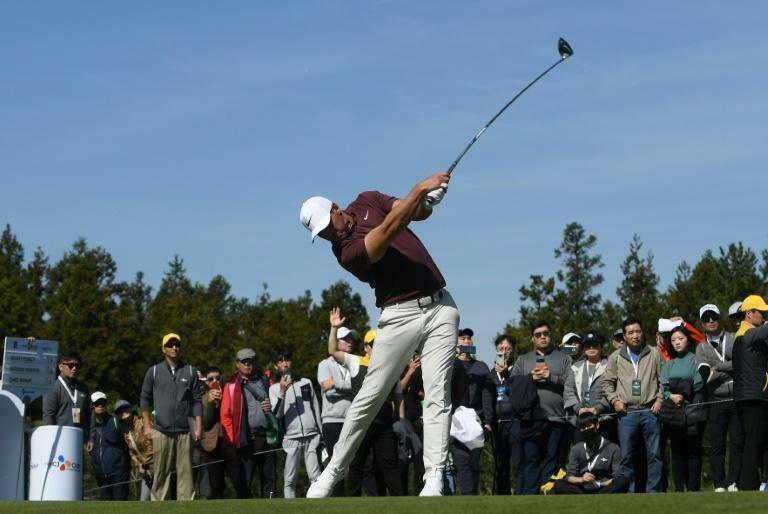 It was another ideal scoring day at the Club at Nine Bridges on the resort island of Jeju, and on a day that yielded 33 rounds in the 60s, Koepka emerged with a comfortable lead following his bogey-free day. Koepka began the day at eight-under, one shot behind the overnight leader, Piercy. Koepka had a string of eight straight pars before finally picking up a birdie at the par-5 ninth to reach nine-under, but remained one back of Piercy at the turn. Koepka grabbed the lead at 10-under with a birdie at the 10th, following Piercy's bogey on the same green moments earlier. Piercy dropped another shot at the 11th, and Koepka opened up a three-shot lead at 11-under with a birdie at the 14th. Koepka drained a nervy five-footer to save par at the 15th and stay ahead by three, and scrambled for another par after sending his tee shot well right of the fairway. The American closed out his day with consecutive birdies at the 17th and the 18th. That final birdie came after Koepka left his eagle attempt just inches short. "I felt like I putted really well again, that was a big key, and then just leaving myself with good looks," Koepka said. "I've hit a lot of greens over the last two days, which has been nice and I just need to continue that." Koepka shrugged off the suggestion that he'd be feeling any pressure from a handful of golfers in hot pursuit. "I just need to go out and play a bogey-free round like I did today," he said. "Just get off to a good start, keep doing what we're doing, put the ball in the fairway, give yourself good looks and keep making those key momentum-building putts." Koepka can dethrone Dustin Johnson as the new world number one if he finishes alone in second or better. Koepka said he'd love to "earn" the top ranking instead of backing into it when he's not playing. "I always wanted to become world No. 1 on the week I was playing. I felt like I could really earn it," he said. "It'd be very special and to do it here would be nice. And hopefully, I'll get to world No. 1 and cap it off with a win." Poulter went out in 36 but picked up four birdies coming home for 68. He said he's going to have do more of the same. "Obviously, Brooks is in cruise control right now," Poulter said. "Yesterday was pretty calm and we had the same kind of conditions today. Tomorrow, I think it's not as windy as Thursday, so with that in mind I think the scoring's going to be pretty good." Six others are tied at eight-under through 54 holes, a pack led by Rafa Cabrera Bello, who had a bogey-free 65. The three-time European Tour champion is seeking his first US PGA win.